I can’t believe how long it’s been since I posted our weekly meal plan on here but honestly, I’ve still been meal planning and batch cooking even though I haven’t been around to tell you about it! It’s just been so busy around here that my meal plan is more often than not written on a scrap of paper while waiting in the car for the kids to finish whatever activity they’re needing a lift home from. I’m not going to lie, I’ve struggled a lot this year with everything – work, home, family, blogging, life – it’s felt like a huge struggle to balance everything and achieve everything I’ve wanted to. March for me is all about balance though as you’ll see from my post tomorrow over on The Diary of a Frugal Family. I’m feeling a lot better after my operation (which caused a lot of my absence from her in the last year) and I’m almost settled back in at work now so it’s time to get myself organised. One thing on my list is meal planning the way I used to do it – without the hurried rush of the last few months. Planning in a rush means that I’ve totally just been sticking to he same old meals and not trying anything new. We’re all a bit bored with what we’re eating at the moment so it’s definitely time to get back into our old ways of mixing family favourites with new meals. As ever, I won’t go into detail about everything but there’s a few things you might be interested in…. The salad bar that we had last night was a change to what we had planned because when I popped to the shop I found a huge amount of salad stuff reduced so I popped it all into bowls and everyone served themselves. I added some boiled eggs, some potatoes and some gammon left over from Sunday lunch and we had a gorgeous tea. It’s pancake day today so we’re trying savoury pancakes with cheese sauce and the last of the gammon from Sunday flaked into it with some brocolli – no idea how that’s going to turn out! 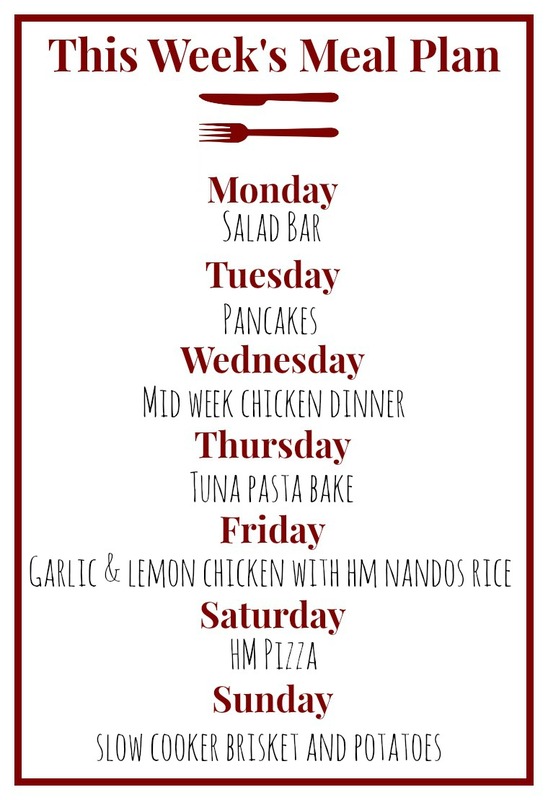 Are you planning anything interesting to eat this week? Don’t miss out on future posts like this – receive updates directly to your inbox by email by adding your email address to the box on the top right of this page and hitting subscribe. You can also follow me on BlogLovin and I’d love to see you over on my Facebook page, or over at Yummly and on Instagram. #WhatsForTeaTonight – Corned Beef and Potato Pie…. #WhatsForTeaTonight – Philly chicken and veggie rice….